Ciao tutti! It is Marilyn here from Take Me Home Italy. While I am off in Italy chasing rainbows and loving every moment of it, I did not want to miss a Travel Tuesday blogpost. Instead, I asked Susan Nelson of Timeless Italy to be my guest today. Susan is an excellent writer, great traveler and experienced Italophile. I asked her to answer three personal questions pertaining to her travels in Italy. Read on and enjoy her wonderful photos too. Thank you, Marilyn, for hosting me as your guest on Take Me Home Italy. I am honored and pleased to be able to share some thoughts and insights that are a result of my many travels throughout Italy. It is a country that, with all of it’s ancient ruins and artifacts, remains fresh and new to me. I especially enjoy sharing my discoveries and experiences on my website, Timeless Italy. If I could live in Italy for Spring, Summer and Fall, which three places would I choose? This is a tough question as I have gotten to know and love each part of Italy, from the north down to the south. Although Italy has an abundance of natural beauty, I have always found that the warmth and friendliness of the people is always what keeps me returning. Puglia to the south is a perfect Primavera destination. 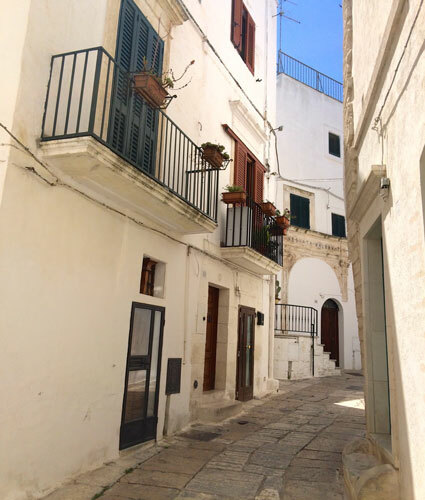 Since Puglia is hot in the summer months, Springtime is perfect for walking through the whitewashed hilltop villages, especially Ostuni and Alberobello. Narrow lanes and pathways are often bedecked with window boxes of lovely bright red flowers that look so beautiful against the white background. Artisans step out of their shops or invite you inside. The air is fresh and fragrant. Leaves are budding and the earth is freshly tilled. I would choose to stay in nearby Polignano a Mare, a charming seaside village overlooking the Adriatic. The Ligurian coast would be my choice for summer with plenty of sunshine and lower temperatures. Spacious beaches, northern Mediterranean cuisine, fresh pesto, and the soft ocean breezes bind me in a love affair that leaves me contented. 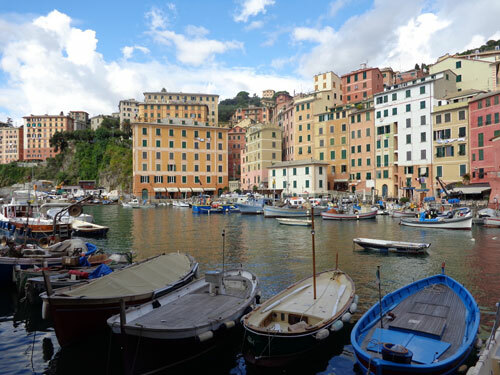 Every village is special, but my favorites are Santa Margherita, Chiavari and Camogli. I’d be doing a bit of sailing, too. Autumn and Tuscany go hand in hand. I love spending weekends wine tasting at the many gorgeous wineries in Chianti. Florence and Siena give me a great dose of renaissance art and architecture that I love so much. A day spent in a little Smart car exploring the many surrounding hill towns is a delight as well as eating the delicious Tuscan cuisine. These three brothers own a cameo shop in Naples where they craft gorgeous cameos right at the front door. What is it about the people of Italy that brings you back? I have found the Italians to be a people of genuine warmth. They are gregarious, fun, emotional, loving, and authentic. There have been several times when I needed help and I was immediately assisted. My first night in Rome, I left my friends in Trastevere to follow the Tiber River up to Castel Sant’Angelo and down a street from there to my lodging. Since I had terrible jet lag and had not gotten a decent look at my room, nor did I have the address, I thought I would recognize it when I saw it. Big mistake. Everything looks different after dark. I knew I was in trouble after meandering the streets next to Castel Sant’Angelo for what seemed like hours. Several locals stopped to help me, and their directions made sense. But I still found myself walking in circles. I finally found a taxi driver and begged him to give me a ride to the hotel, whose address I finally found. He gave me very simple directions instead. I followed them and within 5 minutes I was home. I exhaled a huge sigh of relief. I never felt in danger wandering the streets. I was just so tired I thought I’d drop with each step. What is it like for you to travel solo through Italy as a tall blonde when everyone else is shorter and usually darker? You know, I have never had any trouble. In fact, no one has treated me any differently than they would anybody else. I think there was a time 50 or so years ago when a tall blond would have attracted attention. But times have changed and as far as the locals go, they are absolutely accepting. Grazie Mille Susan! Thank you so much for sharing your stories. It was a pleasure having you post here. To all of you enjoying this read, check out Susan Nelson on Twitter, Facebook and the web. Now it is time for me to explore more of Italy so that I can help you create your own dream adventure in Italy.